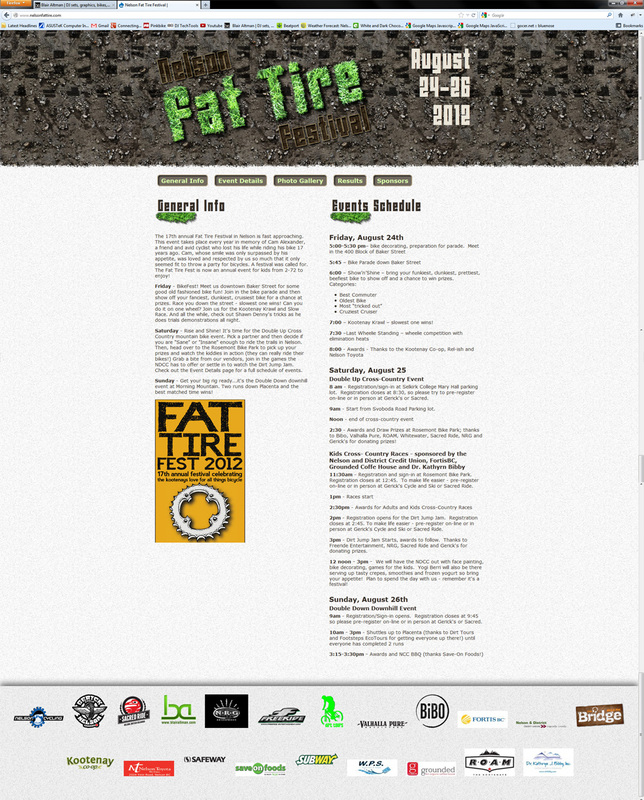 This year the cycling club decided to do a website to promote the Nelson Fat Tire Festival. The goal was to promote the event easier to people in Nelson and to try to draw more participants from the nearby communities by making information more available. The festival is a 3 day event that is held near the end of the summer each year in memory of Cam Alexander, a fellow cyclist who lost his life. Over the 3 days there are kids races, a dirt jump jam, downhill and XC races, and other events downtown. The site was made to be simple for the event organizers to update and on a tight budget. I used Drupal so that I could pull that off easily on the tight timeline that we were under. With no real direction as to what the content for the site was going to be I decided to just make it a simple couple of pages that would allow them to post the key information about events, results, and post photos in a simple gallery. One of the other key requirements was to make it very visible who the event sponsors were since they are a main reason the festival is financially possible. Sponsors were laid out across the footer and visible on every page, and the rest of the layout allowed for easy expandability for future growth. I'm fairly content with the result considering it took under 10 hours to complete the design and development.